This team was responsible for completing the Sensory Cube prototypes that we sent to Ecuador in March 2016. They’re back to complete a similar project for a local organization, Lifestream, which caters to adults with severe physical and cognitive disabilities. To fit Lifestream's needs, the team is designing a new Sensory Wall that is meant to be a larger, more permanent fixture. Some of the sensory experiences on the wall will be taken directly from their work on the cube, but much of the wall will offer new experiences that are more relevant to Lifestream’s adult clientele. In particular, the therapists at Lifestream are interested in experiences that encourage their patients to practice real-life motions, such as flipping a light switch. Researchers Sari Altschuler and David Weimer are working to bring an element of blind culture into the seeing spotlight. Before the development and promulgation of braille as an improved method of conveying information via tactile senses, the most common strategy for making information accessible to blind individuals involved translating a normal page into a 3D version of itself. Wherever there was ink, so followed a smooth bump detectable to fingers. 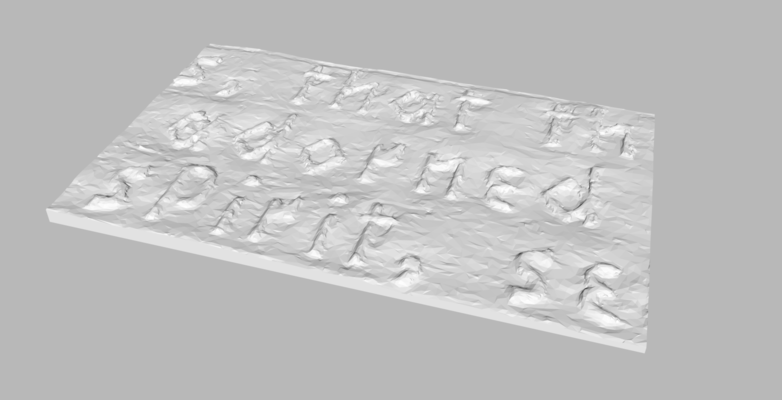 To bring these artifacts to the public, Sari and David applied for a grant to develop popup exhibits featuring 3D printed versions of the artifacts found in the Perkins School’s archives. Ultimately, institutions and museums across the country will be able to host their own exhibits by downloading a set of files and reproducing the artifacts in printed form. Enabling Engineering offered technical assistance to develop printing methodologies and create digital representations of the artifacts. A 4-year old with very limited motor controls and a visual impairment is in need of more freedom and independence which we hope to provide by building a small car that he will be able to use with his given limitations. The alterations made to the small car include changing the location of the acceleration button, configuring a new turning mechanism, and installing a four point harness to better stabilize the client. With limited motor control and visiblity, the acceleration pedal, was changed to a pressable button mounted on the left side of the car, near where his left hand would rest. 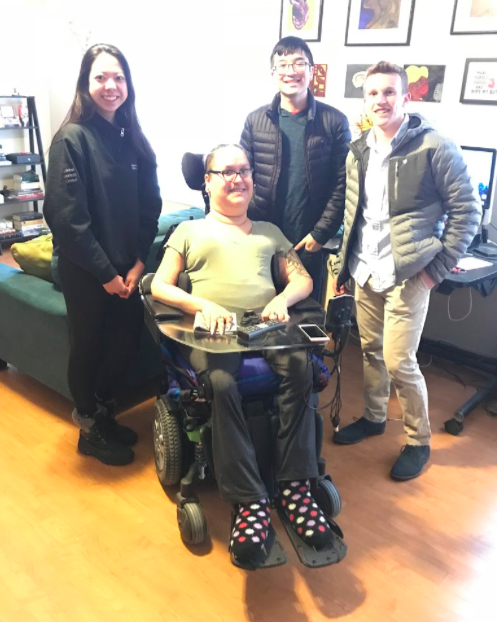 Because of his disability, he would also be unable to turn a steering wheel, so the method of turning the front wheels will be converted to more buttons or head switches which will control a linear actuator attached to the front axle. For him to be able to drive around on his own, he must also be very stable in his seat to prevent any possible injuries. To ensure this, a U-shaped support structure made of PVC pipe was anchored to the back of the car, with a four-point harness attached across it and to both sides and the rear face or the car. Max Plansky has cerebral palsy which inhibits his motor skills to the point where it is impossible for him to play video games, specifically Xbox, using traditional control systems. Our controller aims to enable Max to play XBox with minimal external assistance. Our current solution is an array of mechanical switches suspended around Max’s head which allow him to control 4 of the 10 buttons on a traditional Xbox controller. The switches are covered with large foam pads to enable comfortable head operation. 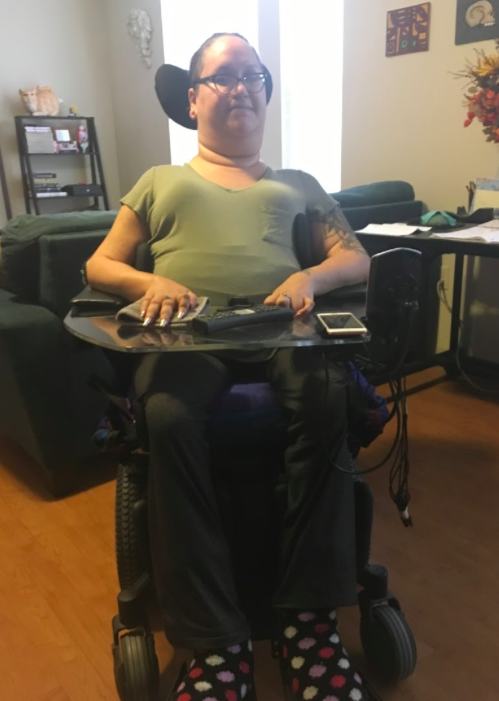 The most recent update includes an inline companion controller so that an occupational therapist or friend can play the with Max and aid him as he learns to use the device. Our next steps include improving the current mechanical system and exploring new technologies, such as myoelectric control, which show potential to better suit Max’s abilities. Virtual reality active videogames (AVGs) are popular physical therapy interventions for children with hemiplegic cerebral palsy (CP) because they motivate children to engage in repetitive arm movements. Adherence to home-based AVG exercise programs is low, and therapists lack an effective means of monitoring children’s game play. Considering the role of the therapist, monitoring is an important component of any therapeutic AVG intervention—an effective AVG must become increasingly challenging as gameplay progresses to ensure the patient does not habituate to or lose interest in the task. Thus, therapists and patients have an unmet need for a user-friendly, in-home performance monitoring device that informs therapists’ feedback and task adjustments. We want to design a automatic wheelchair umbrella system that will work for all kinds of wheelchair and easy for people to assemble. Our idea is to attach a reverse open umbrella on her wheelchair and also design a structure which will provide a convenience control over the attached umbrella. A reverse-opened umbrella will keep our client and her wheelchair dry even during the process of closing the umbrella. Virtual reality active video games (AVGs) are popular physical therapy interventional for children with hemiplegic cereal palsy (CP) because they can motivate children to engage in repetitive arm movements. Adherence to home-based AVG exercise programs is often low and therapists require a way of monitoring children's game play in order to progress game challenge and provide motivating feedback. The purpose of our project is to develop the prototype for a sensor-enabled smartphone app that track arm movement, measures energy expenditure, records game difficulty levels and capture children's self-reported motivation, in order to facilitate child-therapist communication during at home AVG interventions. 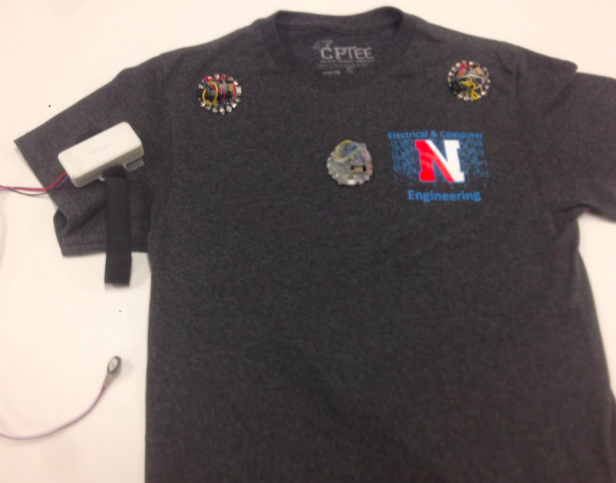 The goal of the project is to design a shirt that uses motion sensors to monitor physical therapy patients during their home exercises. Physical therapists can then access this data in order to monitor their patients' progress. In addition, the client can use a smartphone app to engagement and efforts during game play. The app may also allow for video upload of game play so that therapists can monitor movement. quality. A prototype shirt has been developed with four sensors, one sensor on each shoulder and one on each triceps. The sensors are connected to an Ardiono, which automatically determines how many sensors if needed due to the plug-and-play design. The data collected from the sensors is sent to a Matlab program that records it. A script then uploads the data to a database. We have also designed a website that will integrate with the database so physical therapists can remotely monitor their patients' progress. The prototype also includes the basis for an app that connects with the website. Sleep disorders, such as delayed sleep phase syndrome, can inhibit a person’s ability to function effectively throughout the day. A large percentage of older adults are affected by fragmented and lower-quality sleep due to age-related conditions like insomnia and cognitive disorders. This can make it difficult for seniors to live independently without the help of a caregiver, and can increase the negative symptoms of conditions such as dementia. Additionally, elderly individuals with cognitive impairments can suffer from a condition called sundowning where their confusion increases once the sun goes down. The goal of this project is to develop a system to encourage healthier and more consistent sleep schedules for elderly individuals with conditions that are causing fragmented sleep patterns. The design is a light-based sleep alignment system that encourages its user to maintain healthy sleep habits throughout the day. The system needs to be non-intrusive and easy to set up with minimal effort on the part of the user so that it does not disrupt individuals’ existing routines and living arrangements. The design consists of three components: a bright LED panel, a pressure-sensitive bath mat, and a combination desk lamp and alarm clock. In the morning, the lamp unit’s alarm is turned off by stepping on the bath mat. The mat sends a Bluetooth signal to the lamp unit to confirm that the user has gotten out of bed. Until the user steps on the mat, the LED panel and desk lamp increase in brightness while an audio alarm plays. In the evening, the LED panel turns on again to prevent the user from going to sleep too early and help combat the effects of sundowning. Finally, a low-frequency bulb in the lamp turns on when it is time to go to bed. Using our system will help elderly individuals maintain a regular sleep schedule and support a more independent lifestyle in those with sleep disorders. Fractures represent a significant medical problem in the United States with approximately 6.8 million fractures coming to medical attention annually. Many complications can occur during the healing process including compartment syndrome, ischemia, heat injury, pressure sores, and neurologic injury. Communicating pain and discomfort to physicians is a challenge particularly for high-risk patients who cannot effectively communicate such as those who are nonverbal, comatose, young children, or have nerve damage. CastBuddy is an integrated sensor sleeve worn underneath the orthopedic cast during the healing process. The CastBuddy is designed to provide pressure and electromyographical (EMG) data to clinicians in order to avoid complications due to cast immobilization. The CastBuddy is designed to have minimal impact on the casting process and is targeted towards high-risk patients. 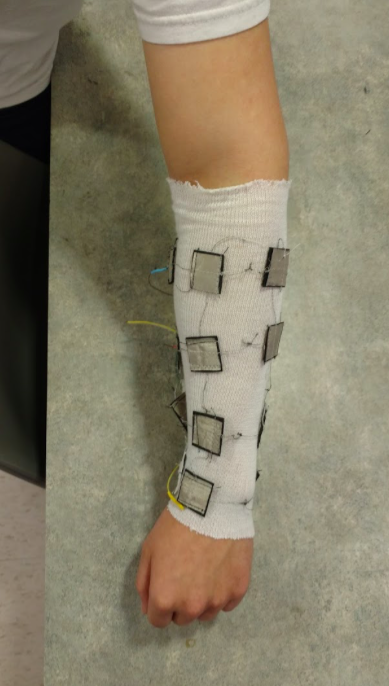 The design incorporates flexible pressure sensors, EMG circuitry, and a user interface to display data for physicians to determine if conditions could be harmful to the patient. The goal of the ‘Sitting Up in Bed Project Team is to develop a specialized solution to allow the client in Switzerland to go from a side laying position to a vertical sitting position. This will hopefully enable the client to transfer from their bed to a wheelchair without the need of a PCA. The client is currently renting furniture and an apartment, so the design of the device needs to be as minimally intrusive to their environment as possible. he goal of the ‘Sitting Up in Bed Project Team is to develop a specialized solution to allow the client in Switzerland to go from a side lying position to an upright sitting position at the edge of the bed. This will allow the client to transfer from her bed to the wheelchair without the need of a PCA. The client is currently renting furniture and an apartment, so the design of the device needs to be as minimally intrusive to her environment as possible." How will be accomplished: "We have developed a free-standing lift device that is customized to fit her bedroom environment. The client will lay on the platform of the device, which rests on her bed. 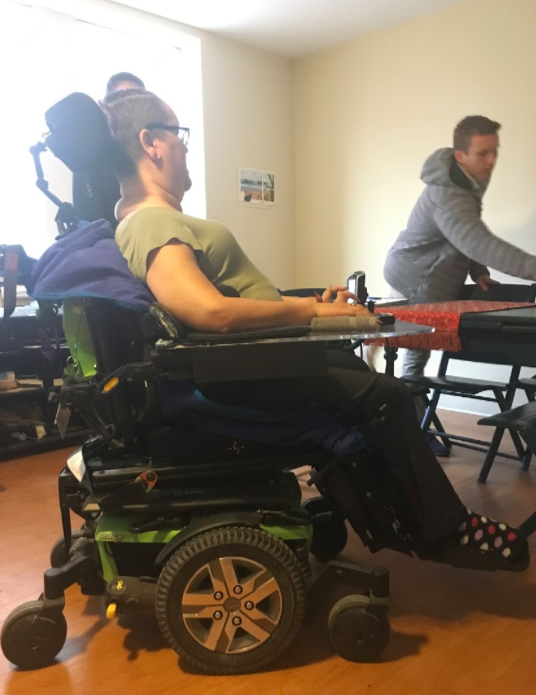 The platform rotates from 0-90 degrees via a linear actuator and allows the client to go from side lying in bed to sitting up at the edge of the bed, where she can then transfer to her wheelchair independently. The client is a 22 year old boy living in Wisconsin who has a rare disability called Trifunctional Protein Deficiency that affects his mobility. It's a condition that's very close to Cerebral Palsy. He cannot walk very well because his body cannot fully process the messages his brain sent. This effect intensifies as the message moves further from his brain. Thus, his extremities suffer worst. His range of walking distance is small, a couple hundred feet at most, and he is in constant danger of falling, so he would benefit from the increased mobility, independence, and safety of a bike. He has use of his arms better than his legs and his shoulder and back muscles are strong. By allowing both hand and feet power, this bike will help our client. Almost all of the commercially available bikes lack a proper steering mechanism that allow incorporation of feet power or would simply be unusable for our client. Out design incorporate a three wheel trike design with two from steering wheels and a rear wheel for power. He raised by pedaling and pushing his handlebar. He steers by rotation his handlebar to a Ackermann system front wheels. The plan for this semester is to further develop the CAD model while simulaneously creating a physical prototype for our designs. The CAD model will be reworked to better fit our client's stature. The physical model will incorporate a prototype for the drive train system that can be operated to drive a stationary wheel. This will serve as a proof a concept for the feasibility of hand bar and feet pedal powering system. 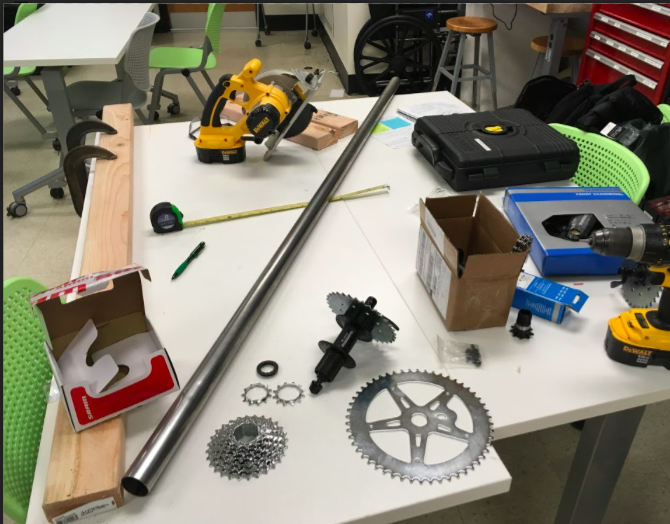 If time permits, the chassis will be built around the drive train in order to advance the eventual goal of providing a complete bike to our client. 1. Using the current design, Lindsay will need help from a secondary person to help her gather her hair at the back. We want to automate/semi-automate this process for her by using a tube slider so that she can do this by herself (without any external help). The slider can be attached to the back of her chair and the body of the vacuum cleaner can be on the side that will allow her to turn it on/off. 2. We want to have an attachment that allows her to deploy the hair tie without reaching out to the back of her chair. 3. We want to have a simple mechanism that allows Lindsay to easily wrap the hair tie around the nozzle of the front attachment. An ideal solution would be to replace hair ties automatically or able to store multiple hair ties at once while only releasing one at a time. Working from the first prototype, modifications were made to the adapted vacuum cleaner for easier use. A sliding rail system was put together using two pipes, pipe clamps, and custom 3-D printed sliders and ends. With this new design, the vacuum pipe will be moved up and down with two timing belts that can be pulled from the front. The release mechanism has also been modified so that the hair tie is automatically released. When the vacuum pipe reaches a certain point, strings attached to the bottom cap of the rail system pull on the switch, causing the hair tie to be released. With these modifications, another person will not be needed to move the vacuum pipe upwards to collect the hair and release the hair tie. To reduce the risk of aspiration pneumonia when drinking for people with Parkinson's Disease and other neurological-muscular disorder. This project is meant to provide a safer and more cost-effective mode of drinking for a wide variety of individuals struggling with any condition or disorder which increases the risk of choking and/or aspiration pneumonia and as such has no distinct client. We will seek feedback from individuals who commonly face these difficulties to improve upon our design (such as the elderly and those with the above described conditions). 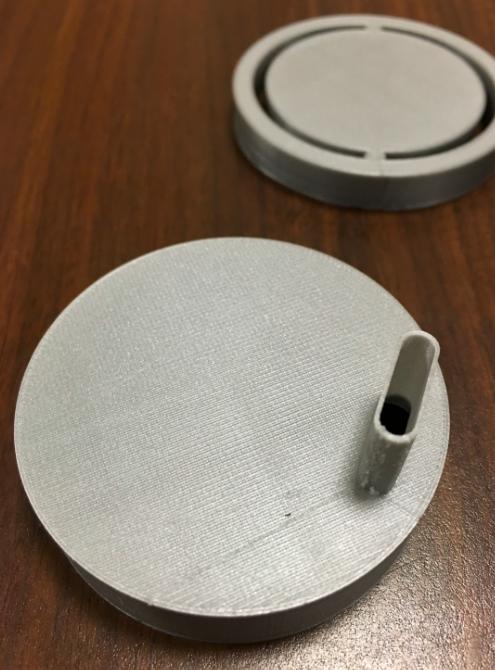 By creating a design which modulates the amount of liquid at the top of the cup so that the person drinking does not have to tilt their head back will reduce the risk of choking and aspiration pneumonia. The handle, which is designed to be easy to grip and accommodate tremors, allows for the individual to drink without the assistance of a caretaker. changes. The user will feel the vibrations of the music in their arms and the small of their back. By feeling the relative frequencies of the music through the chair and feeling chills at significant moments in the song, the user will be able to experience music in their own way. The device will provide an alternative to the Phillips lite aid. The product should allow the children to practice auditory and color recognition, as well as motor control. 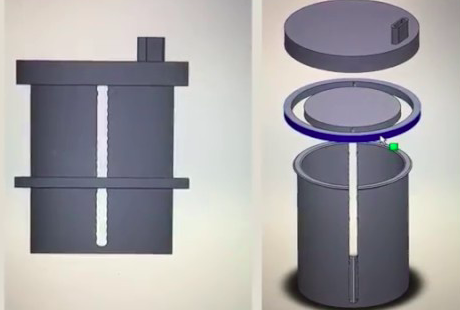 The proposed device is a full version of the prototype that was completed last semester. The device will feature a 2x2 grid of peg holds, each featuring an indicator light and color sensor. The device will also house an LCD screen and buttons for the operator and a speaker give instructions and positive audio feedback. The general use process would be to have the teacher select the particular 1 of 3 recognition skills for the student to practice. 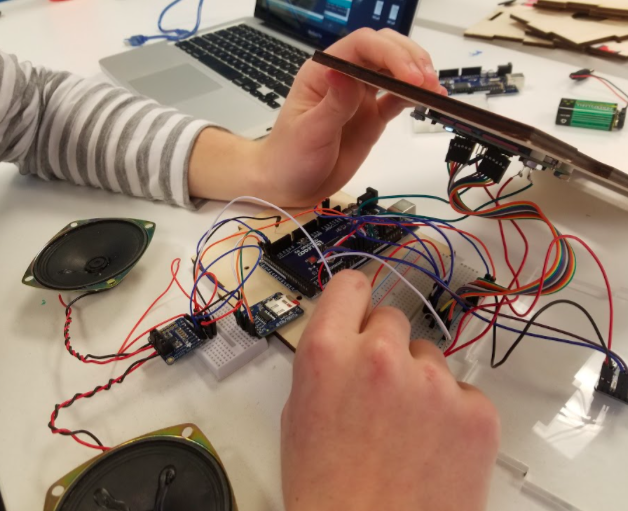 For example if the students needed to practice auditory recognition, the teacher would select this and the Arduino would play through the speaker for example "Blue peg". In which case the student would then need to insert the blue peg into the hole, wherein the computer would confirm or deny the selection. A similar process would be carried out for color and textual recognition. Brian, from the National Braille Press (NBP), would like to have an infrared scope which would be capable of sensing a target at a set distance. The scope would then alert the user when the target is in sight. The goal of the project is to create this scope, and use it in fundraising events that will be used to raise money used to help the visually impaired. Not only will the device help with fundraising, but it would also enable individuals with visual impairments to aim and shoot a gun with higher chances of hitting the target. The ideal range of this system would be 50 feet. The project will consist of an arduino scope, a rechargeable lithium battery, and a 3D printed casing. The battery limits are never approached so failure due to heat is not viable. The scope consists of an arduino board, a class one laser sensor, an audio jack for the user alert, volume control, and power control. Our goal is to construct a low battery signal, a user friendly distance calibrater, and possible bullseye detection. The casing also needs improvements including input holes for headphone jack, distance calibration display or input, and gun mounting. This project will also have to be tested for functionality and durability. The physical disabilities of the client prevent the child from controlling a typical power wheel. The child needs a way to control the vehicle with simple buttons or joysticks, while being securely and comfortably strapped in. In addition, the client’s mother would like a way to remotely control the car as a safety measure. The client has physical disabilities that impart his motor function. 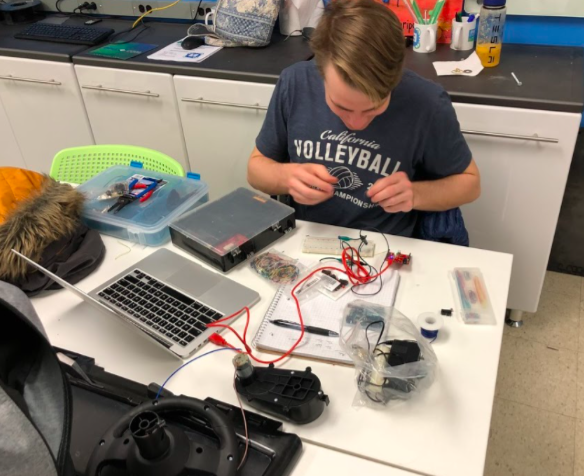 We are addressing this by linking a Child Ride-On Car to a remote control and modifying the Car's steering capability and battery components so that a 3rd party can control the speed and direction the car takes. We are also addressing any support mechanisms that needs to be implemented to contain the client comfortably according to his needs, such as head padding and a chest harness. To address this issue, we have used game design principles to integrate the advantages of VR into an accessible, low-cost physical toy. The FITBoard (Fun Interactive Therapy Board) is a rehabilitation tool consisting of a tablet and boards with touch keys that parents can configure in different ways. Toys and other interfaces are attached to the keys to control sounds, videos, or games. The FITBoard will motivate children to engage in repetitive practice of functional head, body, arm or leg movements, depending on its configuration. We are now evaluating FITBoard’s usability among a sample of children, parents, and therapists in two rehabilitation settings. We will assess users’ interaction with the FITBoard and evaluate factors that may impede or facilitate its use in rehabilitation. Our findings will inform future research. Ultimately, the FITBoard can be integrated into interventions to increase practice dosage, enhance outcomes and improve quality of life for children with disabilities. The client has limited use of the left side of his body, but wishes to play the acoustic guitar. 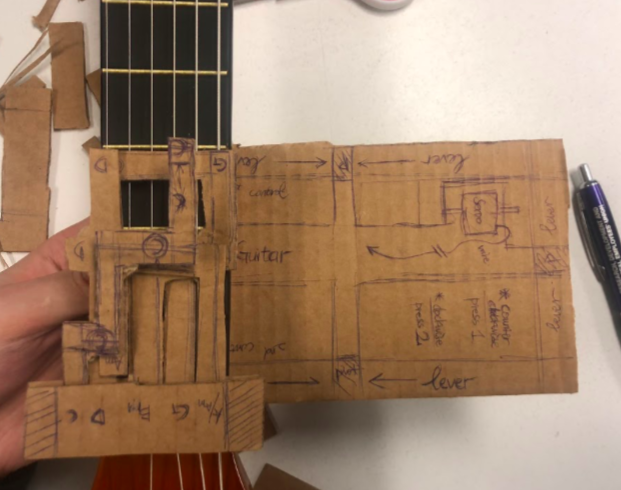 The parents of the client have asked that we create an apparatus that allows the one-handed usage of an acoustic guitar. Ideally, this design would be able to press chords and allow the client to strum at the same time with his right hand. It is important to note that the client does not have much strength in his left hand either. The client is a big Beatles fan. Our solution is a device that will press the strings on the guitar and from the chords so the client does not have to. It involves a system of cantilevers, each shaped to form a specific chord, activated by a system of strings connected to servo motors. These servo motors are activated with a button press in the prototype, but for the final version will be controlled by an easier method for the client such as foot pedals. This device will play Am, C, D, G, and Em chords. These chords are tailored to the Beatles song Blackbird, but will work for most popular songs.